When my husband and I moved in together in our twenties, we didn’t have a lot of money. Every Sunday, he would make up a big pot of something that we would have during the week, like meatballs and gravy or chicken stew. With the addition of kids to the family, we moved away from soups and stews even though they’re frugal and filling. Since I need to stretch our grocery budget as much as I can while providing nutritious meals, I’ve started including stews in the menu. 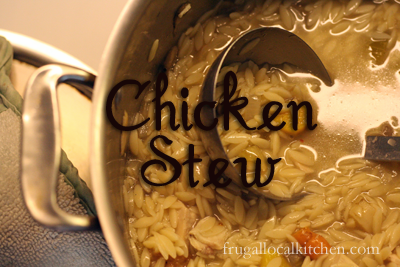 I like this chicken stew recipe because I can include veggies in it which some of the kids will eat, and the stew is cooked in chicken stock. I always make my chicken stock with lots of vegetable peelings to get as much nutrition and flavor into it as possible. The other joy of this recipe is that it can be made at the last minute if you already have veggies prepped in your fridge. You can freeze this; the orzo pasta I use holds up pretty well to freezing. If you’re not sure about the pasta, simply make the stew without pasta, freeze it, and then cook the pasta in the stew when you’re reheating it. Prepare the vegetables by chopping them into bite-sized pieces. I vary the amount of vegetables according to my whims and whatever is in the vegetable drawer. In a large flat pot, saute the chopped vegetables in several Tablespoons of butter until slightly soft and translucent. Cooking them in butter prevents them from getting browned. Add the minced garlic towards the end. Add the chicken stock and water to the pot and bring to a boil. Simmer the vegetables for about 15 minutes. Add the pasta, turn off the heat, put the lid on the pot, and let it sit for at least 15 to 20 minutes. The pasta will absorb the liquid. This is definitely going on our winter foods list. I am trying to compile a good list of “stretch it out” meals. Thanks for linking up to Tuesday Greens! Your chicken stew looks comforting and delicious! Thanks for sharing the recipe with us at the H&S Hop. Definitely one of our favorites. I love to serve potato bread on the side. This looks delicious! We tend to move toward soups/stews/chili in the fall. Typically on Sunday I will have something going in the crock pot and then we eat it for several meals throughout the week. I also really like to make veggie stock and have that on hand in the freezer for when I do want to make a quick soup. Thanks for linking up with what i am eating!